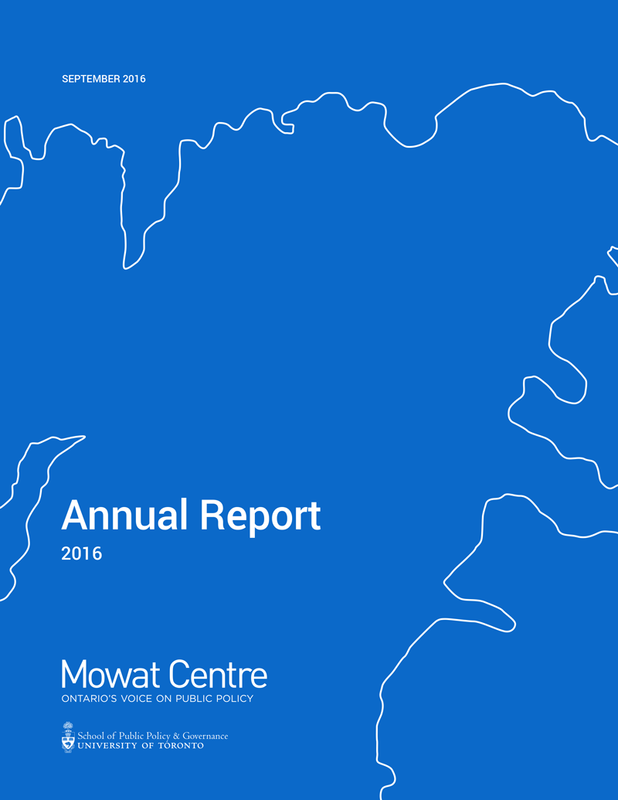 Mowat Centre’s annual report provides an overview of our publications, activities and public policy impact for the 2015-16 year. In the following pages we present our 2015-16 annual report. Through a period of leadership change, Mowat remains highly active, impactful and widely cited. Federal Budget 2016 contained a number of policy proposals that Mowat had developed or helped popularize (see p. 13-15 in this report). While we were not alone in calling for many of these initiatives, and the budget documents do not attribute them to any organization in particular, we still take pride in seeing the Mowat Centre’s proposals become Canadian government policy. We also released a report outlining 32 recommendations for a federal economic agenda for Ontario, based on research and cross-province consultations conducted with the Northern Policy Institute and Build Stronger Cities in 2014-15. Work by Mowat, including the two Mowat hubs, has been acknowledged as informing the Ontario government’s strategic framework and action plan on community hubs, local poverty reduction fund, social impact strategy, long-term energy planning and response to the Energy East pipeline proposal. Our work has also informed the City of Toronto’s poverty reduction strategy. Collaboration was a particularly important aspect of our work this year. We partnered with several other think tanks on a ten-report project highlighting areas of Canada’s social architecture that need modernization, and with the Atkinson Foundation on a three-report (so far) series exploring mechanisms through which governments can use their purchasing power to reduce local poverty and achieve other community benefits. 2016 also marked the successful conclusion of our five-year partnership with the Ontario Chamber of Commerce in producing research and an annual package of recommendations on how Ontario can strengthen economic growth. We continue to be the go-to voice for expert commentary on the efforts of governments at all levels in their attempts to grapple with disruptive challenge posed by Uber, Airbnb and other sharing economy companies. Our experts and work on these issues have been quoted in well over a hundred media stories, and we have given over a dozen broadcast media interviews, appearing on most major media outlets in Canada. We have also given 20 public presentations, and have briefed federal, Ontario and Nova Scotia officials, regarding our work on this file. Our research hubs, Mowat NFP and Mowat Energy, retained a strong industry profile thanks to both new work and the continuing resonance of previous work. With new executive leaders in place, exciting multiyear research agendas are being pursued at both hubs. Our knowledge transfer activities continued in full force. We hosted two more well-attended Policy in a Pub events casting a policy spotlight on the sharing economy and its challenges to policymakers and on the future of Canada’s social architecture. We also co-organized an Ottawa event with high-profile climate scientist and activist Tim Flannery to discuss the role Canada could play in the global effort to halt climate change. Our TLDR posts remain popular, and are increasingly being cited or used by journalists and stakeholders alike. We want to express our continuing gratitude to the University of Toronto and to the School of Public Policy & Governance for their ongoing partnership, support and encouragement. The School and the administration have provided a nurturing intellectual environment that both enriches our work and enables us to have a meaningful impact on Canada’s public policy conversation.